Rhyme, alliteration and assonance add beauty and rhythm to this delightful story about father rabbit and his little one. 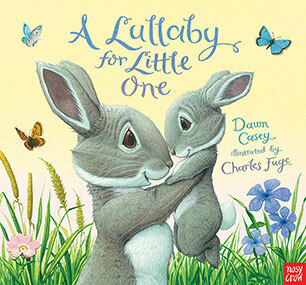 It is a story of love and the importance of play, especially before bed to secure sound sleep. This beautifully illustrated board book will become a favourite with toddlers. Gorgeous full page colour illustrations and double spreads give a panoramic view of the forest where the two rabbits prance. Close-ups of butterflies and flowers, grass and tree trunks, give the impression that you are walking in the forest with the animals. The images invite the child into the setting. They appear so close. There is so much for young ones to learn, mainly new words with accompanying images. Introduced are mushrooms, daisies, rocks, wild flowers and grass. There are birds and insects that crawl and fly, and tiny animals that live in the ground and in tree trunks. The delight of play in rock pools and leaping from bank to bank is visible in the animal’s expressions. Even the bear is enjoying the fun as they all roll and tumble. Open spaces and nature in all its forms is showcased here. But the essence of the whole story is freedom, play and love. Too beautiful for words!